CHICAGO , IL / ACCESSWIRE / FEBRUARY 18, 2018 / The DNotes digital currency is four years old today, and one of its co-creators, DNotes Global Inc. co-founder, and CEO Alan Yong, marked the occasion with an article that details the project's previous accomplishments and future plans. In that piece, Mr. Yong talked about the importance of observing important milestones like anniversaries and how those observances provide an opportunity to put things into context. In remarks earlier today, he explained why he wanted to celebrate the digital currency's birthday in this unique way. "Four years may not seem like a long time, but a lot can happen in just a few short years. That's especially true in the cryptocurrency space, where innovation occurs at breakneck speed. 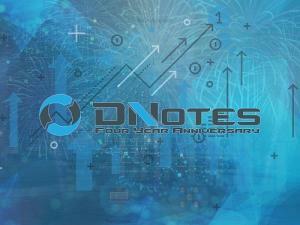 For DNotes, the last four years have been a time of steady progress, as we have methodically rolled out the various components of the DNotes ecosystem." "Stakeholders who have been with us since the first launch in 2014 are aware of that progress," he continued. "However, many of the more recent DNotes holders are less familiar with the currency's history. I wanted to take this opportunity to summarize our progress, commemorate what we have accomplished to date, and briefly touch on the exciting changes that are coming in 2018." "Our goal was to make DNotes a digital currency with purpose: to become an accepted cryptocurrency that can supplement the world's fiat currencies and provide financial inclusions and empowerment for people everywhere." His detailed account of DNotes' progress over the last several years provides some clues about how his company plans to accomplish that purpose. Much of his article is devoted to detailing a timeline of accomplishments, as he explores the digital currency's history and the steps the company has taken to create a working infrastructure to support DNotes' objectives. Considerable space is also devoted to the company's future endeavors, of course – and that seems fitting for a company that keeps its gaze firmly fixed on the future. According to Yong, the next version of DNotes is arriving soon. Aptly named DNotes 2.0, the new cryptocurrency will replace the existing version, and contain new features and benefits. DNotes 2.0 will reportedly be based on Proof of Stake, and stakeholders will be provided with new and improved blockchain staking rewards. Yong also talked about the company's other major plans for the next few months and years, including the imminent launch of a mini-IPO to raise funding that will be used to advance the company's goals. Other plans include a new digital currency exchange, banking services, payment systems, charitable enterprises, and more. "On this, our four-year anniversary, we can all take pride in everything that our community has achieved in such a short period of time – even as we look forward to the unfinished work that lies ahead." DNotes co-founder Alan Yong is a well-regarded visionary who established Dauphin Technology in 1988. He is the author of the book "Improve Your Odds: The Four Pillars of Business Success and is well-regarded as a "thought leader" in the cryptocurrency industry. DNotes is a digital currency noted for its consistent and reliable growth and innovative initiatives that actively engage women, young people, small businesses, workers, and others – effectively inviting the world to participate in the digital currency revolution. DNotes Global Inc. has plans to launch DNotes 2.0 in early 2018, with improved features and functionality. For more information, please visit http://dnotescoin.com.